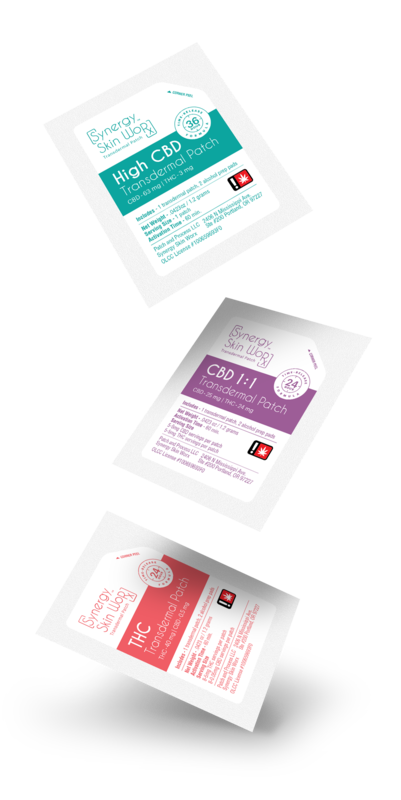 The Synergy Skin Worx™ Patch is designed to give you a constant, controlled dose of cannabis into the bloodstream every hour. If you do not like the effects or sensations from the patch simply remove it and delivery will dissipate within 45-60 minutes. Go about your day as if the patch wasn’t even there. Activities such as showering, working out, or swimming will not impact the patch. 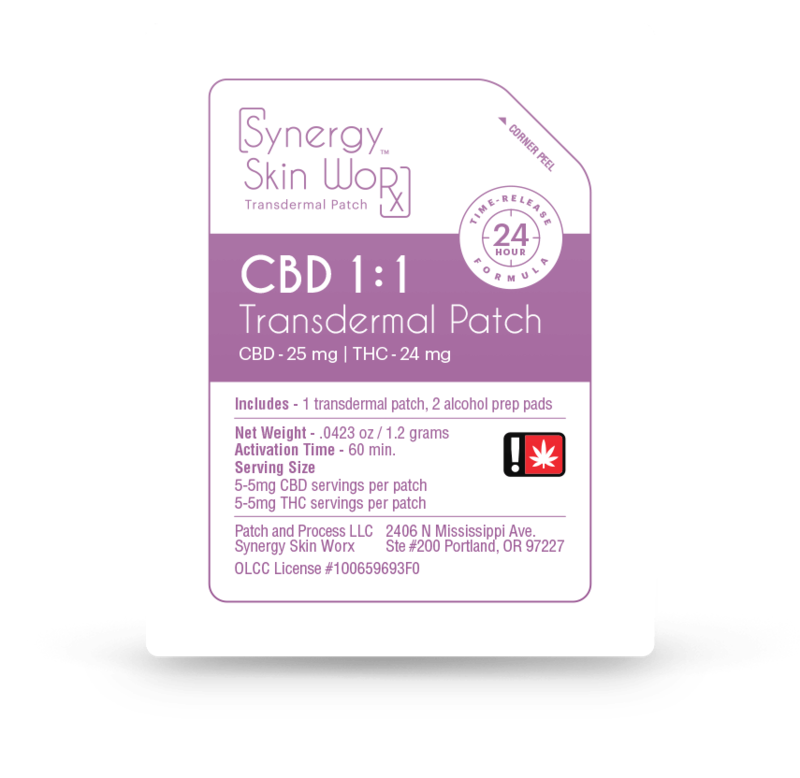 Synergy Skin Worx™ Transdermal Patches are proven to be one of the most efficient methods for cannabis use. Absorption rates are versed unlike smoking or ingesting cannabis. Synergy Skin Worx™ time-release formula allows for you to use a patch over a 24hr or 36hr time period. You do not need to remember to dose with cannabis regularly. Just put the patch on and go. Synergy Skin Worx™ Transdermal Patches can be placed anywhere on your skin (avoid hair and tattoos). Prep with the alcohol prep pads that are provided and place the patch on the cleaned area, the cannabis will go where the blood flows. Synergy Skin Worx™ Transdermal Patches can be cut into smaller sizes for smaller dosing making one patch multiple doses. We recommend always starting with half just to get a feel for the patch. It can be cut into whatever equal servings you would like. Synergy Skin Worx is the only cannabis product or pharmaceutical product that helps with my nerve condition. The cannabis goes where the blood flows. What is a cannabis transdermal patch? A cannabis transdermal patch is an adhesive patch that is placed on the skin to deliver a specific dose of cannabis through the skin and into the bloodstream. The benefit of cannabis transdermal delivery is constant consistent dosing of cannabis over a prolonged period of time. I can use the High CBD patch and have no side effects. This makes it easy to go about my day with confidence and a clear mind with no pain! What ailments does the Synergy Skin Worx Patch help diminish or resolve? Diabetes, and Cancer Cell Reduction. All of the flower made to create Synergy Skin Worx Transdermal Patches is grown by Synergy Farms. Synergy Farms is Synergy Skin Worx family owned and operated cultivation site. They personally grow specific strains comprised of THC and CBD ratios that are vital for making the patches unique and effective. All of the flower is tested at an ORELAP state-certified lab before being processed into full extract cannabis oil for patch manufacturing. The flower is screened for potency and pesticides. The flower that Synergy Farms grows is processed into full extract cannabis oil. This oil is processed by an OLCC licensed processor in the State of Oregon. Synergy Skin Worx believes that full extract cannabis oil is the best substance to use in the creation of their transdermal patches. 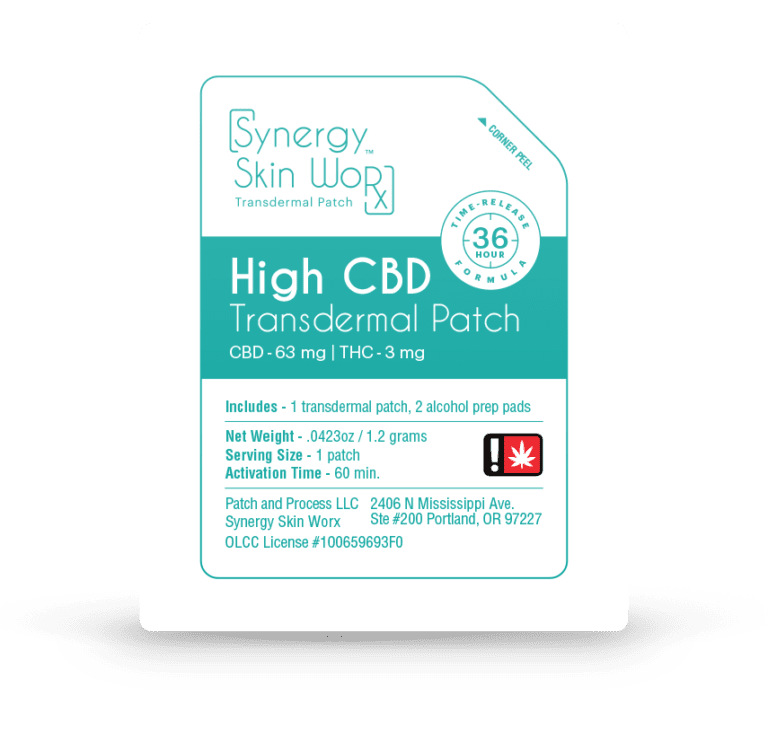 Synergy Skin Worx transdermal patches are then made with their specialized time-release formula into specific ratios of High CBD, CBD 1:1, and THC. Synergy Skin Worx tests their transdermal patches through a third party lab that specializes in delivery rates. The lab performs these tests with cadaver skin to get a flux report that shows the absorption and delivery of their product. Once the patch is created, it is then sent back to the ORELAP state-certified lab to be tested in a control study for potency. The lab chooses patches at random out of their current stock and perform multiple tests to make sure that each batch is consistent.